We’re pleased to announce the publication of our Spring 2018 Newsletter. Inside you’ll find our annual portfolio managers’ letter about what we’re seeing in the market and how we’re preparing for the next phase of the market cycle, as well as lots of other news about Arixa’s activities, publications and events. 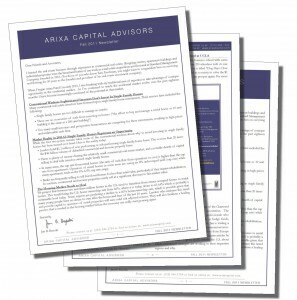 Arixa Capital has published their yearly newsletter comprising of highlights and opportunities throughout the year in review. Arixa Capital is pleased to present our Summer 2016 Newsletter. This edition features news about Arixa funds, recently funded loans and events. 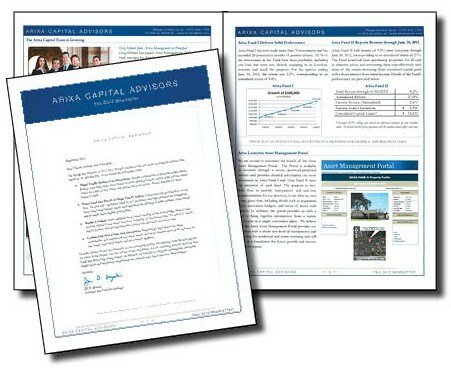 Arixa Capital is pleased to present our Winter 2014/15 Newsletter. Arixa Capital has released a new white paper focused on the U.S. housing market and single family homes as an asset class for investors to consider. The white paper is based on Arixa's concrete experience investing in this area in recent years, working with local operators who buy properties in a specific geographic area, renovate them, and either lease the homes or resell them. The white paper explains various ways that investors can gain exposure to this asset class, which Warren Buffett recently endorsed as underpriced and attractive. The author explains the advantages and disadvantages of various investment strategies for both active and passive investors. The white paper also explains that the activity of thousands of local operators is already helping to work through the backlog of foreclosed homes. Attracted by appealing profits, local operators will help the housing market to heal over the next several years. Policies that aim to solve the problem on a mass scale are neither needed nor advisable. For a copy of our white paper, please click here. 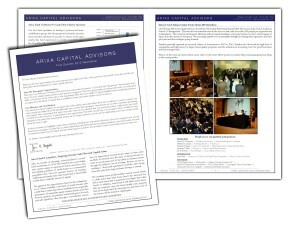 Our first newsletter of 2011 is now available. Topics covered include selected recent investment originated by Standard Capital; our 6th Annual Round Table Discussion at the Anderson School; and Jan Brzeski's course on trust deed investing at UCLA Extension. Topics covered include the 5th Annual Round Table Discussion at the Anderson School, Jan Brzeski's upcoming course on trust deed investing at UCLA Extension, and a summary of Arixa Capital's residential fund financial performance year-to-date. To learn more, please access our Fall 2010 Newsletter below.